Following a high-profile international competition (that included high profile names like Zaha Hadid, Rem Koolhaas and Richard Rogers) lasting for six months, Foster + Partners was appointed to design the first full-block office building on Park Avenue for 50 years. The new tower at 425 Park Avenue, which will stand alongside Modernist icons by Mies van der Rohe, Eero Saarinen and Philip Johnson, is conceived as a flexible, enduring new addition to one of New York City’s most celebrated streets. 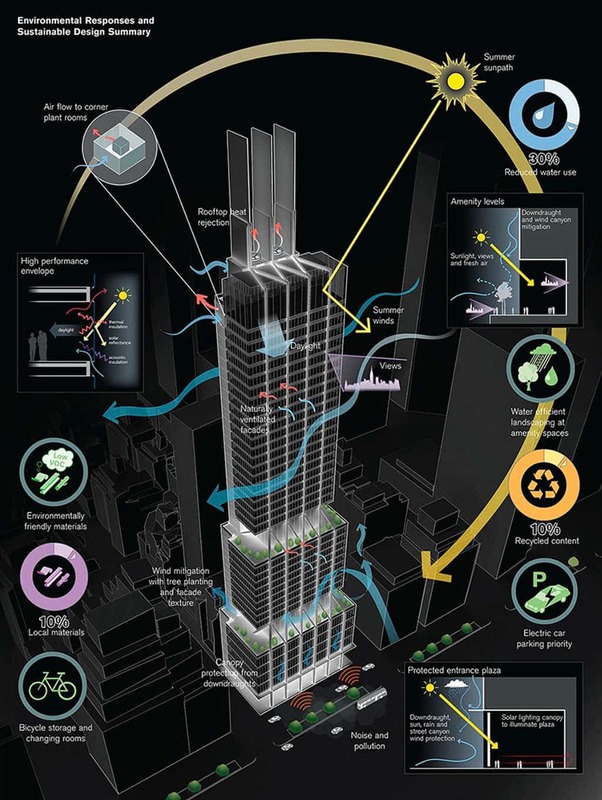 Expected to achieve LEED Gold Status, the office tower will rise 209 metres to claim its spot on the New York skyline. “Clearly expressing the geometry of its structure, the tapered steel-frame tower rises to meet three shear walls that will be illuminated, adding to the vibrant New York City skyline. Its elegant facade seamlessly integrates with an innovative internal arrangement that allows for three gradated tiers of column-free floors. Offering world-class, sustainable office accommodation, the new building anticipates changing needs in the workplace with large, flexible open floor plates. Each of the three tiers – low, medium and high-rise – is defined by a landscaped terrace with panoramic views across Manhattan and Central Park. To maximize the Park Avenue frontage, the core is placed to the rear, where glazed stairwells reveal long views towards the East River, while at street level, there is potential for a large civic plaza with significant works of art,” Norman Foster commented. The tower’s form is a pure expression of its function. The building is divided vertically into three distinct volumes: a seven-storey base, knitted with the urban grain at street level; a recessed central section; and a slender column of premium offices at the top. These proportions were established through a process of detailed analysis, involving modelling views of Central Park from the site and finding the ideal distribution of areas to achieve a balanced composition. The first set back – a characteristic feature of high-rise design in New York – corresponds with the datum of the street. The second set back develops this theme, physically and symbolically setting the upper levels apart from the rest of the city’s office towers. To maximise the Park Avenue frontage, the core is placed to the rear, where glazed stairwells bring life to the eastern elevation and reveal long views towards the East River. Clearly expressing the structure, the tapered steel-frame tower rises to meet three shear walls – extending from the top of the tower, these three blades will provide an elegant marker on the skyline. Between each volume, the office floors are intersected by dramatic triple-height sky gardens. Offering the prized amenity of open space in the heart of Manhattan, with bars, cafes, facilities for meetings and conferences, the 42- foot-high levels function as urban squares in a vertical city – they will also provide a magnificent setting for gala events. The gardens are defined by a horizontal grid of louvres and sheltered from the wind by a discreet band of glazing. The rectilinear spaces are then bounded by diagonal columns, exposing the structure to emphasise the vast scale of the enclosure. The social focus of the tower continues at street level, where entrance is via a dramatic triple-height atrium and a large public plaza, with the potential for large-scale works of art.